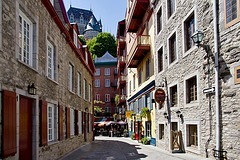 Quebec City is full of culture and history and because of its age, it's reputed to be the closet one can get to a European city without having to cross the pond. 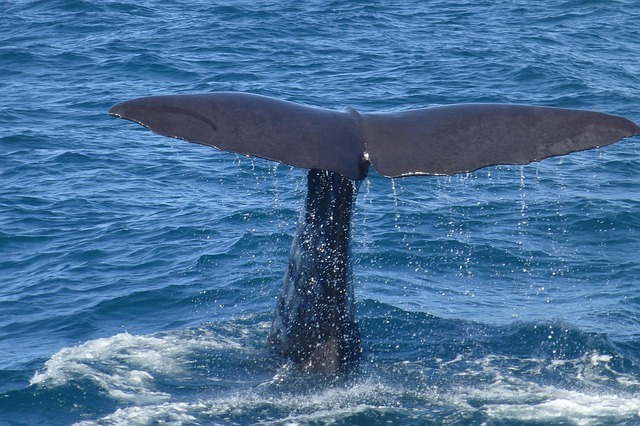 There are galleries, museums, world-class restaurants and shops, all within walking distance of the cruise terminal, making it a wonderful port of call. 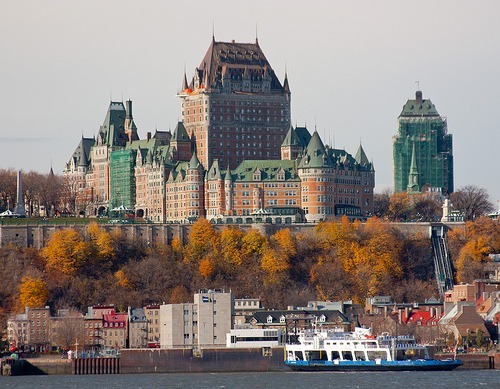 Weather: The months from June to September and December to February are the best times to visit Quebec City. Summer always has pleasant weather, but winter is a good time to visit due to the many indoor festivals if you can stand the cold. In the spring and autumn, the city is especially picturesque, with colorful natural sights emphasizing the city’s impressive beauty. Wireless Internet: WiFi is located at many cafes or restaurants, often with a purchase. Languages: The main language of Quebec City is French, but many speak English. 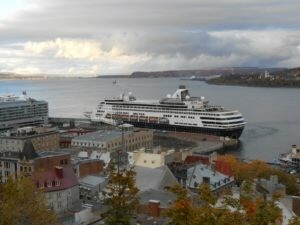 The Quebec City Cruise Terminal (known locally as Ross Gaudreault Cruise Terminal) is located at 84 Dalhousie Street. Quebec City is ideal cruise sightseeing as the feel of the old city is as close as you’ll get to old-world Europe without actually crossing the Atlantic. It is the only fortified city in North America north of Mexico. 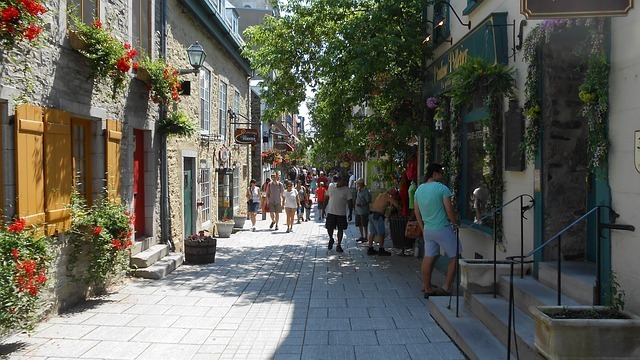 Walking – The famous sites of Old Quebec City are a short 10 minute walk from the cruise terminal, including great shopping, fabulous cafes and museums and galleries. Parts of the old city have cobblestone streets, which can be tricky, especially if one has mobility issues. Also, There are quite a few steep hills and stairs to get from the Lower Town, which is at water level, to the Upper Town, so if walking is difficult, it is recommended to get a taxi to take you up the hill, or pay $2 (cash) to take the Funiculaire up the hill (great views!). Car Rental – Renting a car is an option if you want to venture outside the city-center, but not ideal for travelling around downtown and Old Quebec. The streets are narrow, many are one-way and twist and turn in directions you wouldn’t expect. Also, it can be tricky to find parking, especially at the height of tourist season from late Spring through Fall. With walking distance of the pier are many shops featuring everything from tacky souvenirs to expertly-crafted artisinal wares. See a list of shopping districts and malls here. There are no shortage of restaurants and cafes withing walking distance of the cruise terminal, many of which have open-air dining. 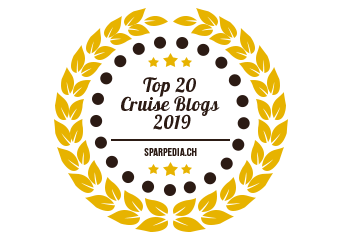 You will find everything from fine dining to fast food and various international cuisine. 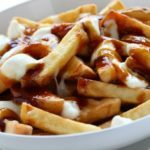 If you’re looking for a great poutine (a Quebec speciality made of french fries, gravy and cheese curds), Chez Ashton provides, and while it sounds like high-end cuisine, it’s actually a local fast-food joint which sources local potatoes and cheese curds to create amazing poutine. Another French-Canadian dishes to try is tourtiere (meat pie), tarte au sucre (sugar pie) for desert. Click here to see restaurants close to the cruise terminal. 1. Old Quebec Quebec City is known for its history, making one feel that they’ve stepped into old-world Europe. 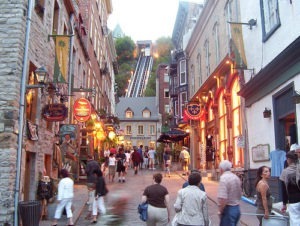 Old Quebec is divided into Upper Town (Haute-ville) and Lower Town (Basse-ville). Upper Town is the only walled city north of Mexico and there are 4.6 miles of walls and gates to explore. Lower Town is older than Upper and many of the shops and restaurants are in 17th century buildings. 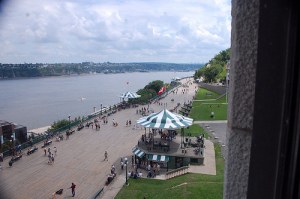 Visit Le Chateau Frontenac by horse drawn carriage, one of the most photographed hotels in the world, or stop listen to street performers while dining al fresco. Terrasse Dufferin is a wide boardwalk built in 1879 offering the best views of the St. Lawrence River and Old Quebec City, including Le Chateau Frontenac and Place-Royale. Sit and people-watch as you listen to talented street musicians or watch ships come into the harbor. 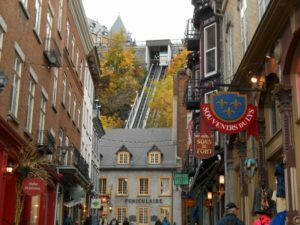 It offers a lovely walk from the Funicular (a cable car that runs up and down the hill between the Upper and Lower Towns) all the way to Plains of Abraham. 3. Plains of Abraham Another must-see is the Plains of Abraham (also known as Battlefields Park), which is the site of the British-French battle of 1759. This park is the heart of the city, like what Central Park is to New York City, the park’s array of summer and winter activities and stunning natural beauty makes it one of the most popular local attractions. During the summer months, visitors are able to take a narrated bus tour of the Plains of Abraham, seeing sights such as the Citadel, the Joan of Arc Gardens, the barracks and the old jail, among others. 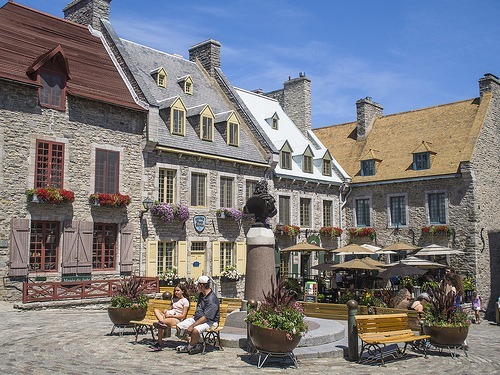 Place-Royale offers a vibrant and lively atmosphere filled with tourists and locals. 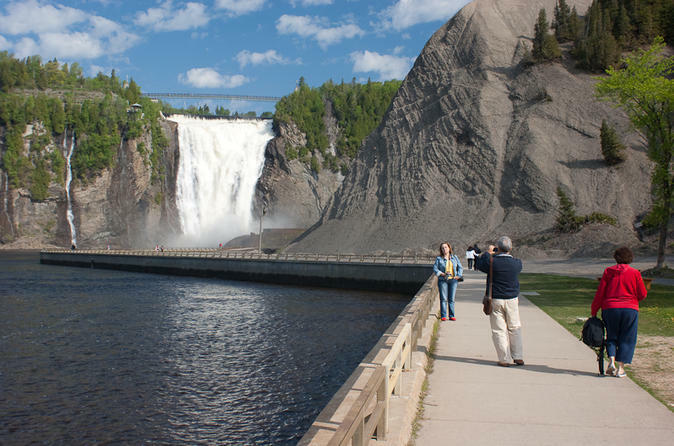 With its array of cafes and an impressive statue of Louis XIV, the area is a great place to take in the distinctive culture that Quebec has to offer. Visit the Place Royale Museum (musee de la Place-Royale) and see what life was like in “New France” in the early 1600’s and the life of Samuel de Champlain. 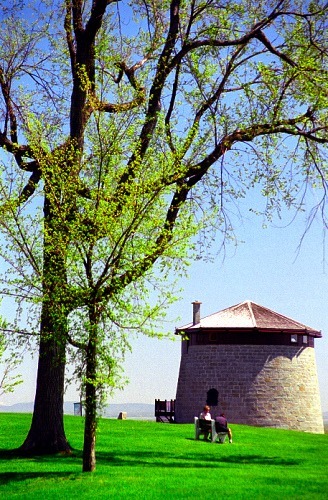 Also visit the oldest stone church in North America – Notre-Dame-des-Victoires. 5. Petit-Champlain District The Petit-Champlain District had humble beginnings in the early 1600’s as a small port village and has grown to be one of the most visited tourist spots in Quebec. The historical architecture and narrow cobblestone streets lie world-class cuisine and trendy shops and boutiques. See the restored 18th and 19th Century interiors of Mason Chevalier.